It was a beautiful, autumn day in southwest Bavaria, Germany. The weather was perfect and the trees were dressed in vibrant colors. My husband and son, copilots on this journey, plugged the day’s coordinates into the Peugeot while I readied my camera equipment. We were eager explorers in a rental car and we were off to find a castle. We weren’t looking for just any castle, mind you. We were looking for THE castle – the famous one which inspired Walt Disney to create the Magic Kingdom. Yep, we were looking for Cinderella’s Castle, er, I mean, Neuschwanstein Castle. Today, GPS technology is incredibly efficient and time-saving, not to mention a MUST for Americans traveling through Europe. When my copilots announced that we had arrived at our destination, we were confused. We saw pumpkins for sale alongside a country road. We heard the bells ring every time nearby cows moved. No castle, though. We saw bright sun and blue skies. We saw road signs and some houses. No castle, though. Then, we noticed cars pulling to the side of the road just up ahead. “Hmmm,” I remarked, “what are THEY stopping for? What are THEY looking at?” I looked up. High atop a cliff, with the beauty of the Alps and sun behind it, it all became clear. Neuschwanstein Castle stands like a royal giant. Up 3,280 feet, it sits somewhere above the pines, but below the clouds, peering down at the lush valley of Hohenschwangau. One is enchanted by the distant sight of it before ever even seeing it up close and personal. As we got closer to the parking areas, we realized that we were not the only ones enchanted by the fairy tale castle. There are lines in which to stand and decisions that need to be made. Do we walk up to the castle which might take almost an hour? Do we get shuttle tickets? Do we take a horse drawn carriage ride for the full experience? We opted for the quickest way up – the shuttle. We took our seats and peered out the windows. Up, up, up we went, until we were dropped off at a shuttle stop with other eager explorers. From there, it was still a ten minute, scenic walk until we saw the first glimpse of it. I joked that I should have brought an inhaler with me. Despite not having asthma, the scenery is so spectacular that it is hard to take it all in and still continue to breathe! As we got closer and closer, we felt smaller and smaller as the limestone walls got larger. Set before us, high on a cliff ledge was a castle with all the makings of a medieval knight’s abode. If a horse with an armored rider carrying a lance were to have passed us on the path, we would not have thought him out of place. 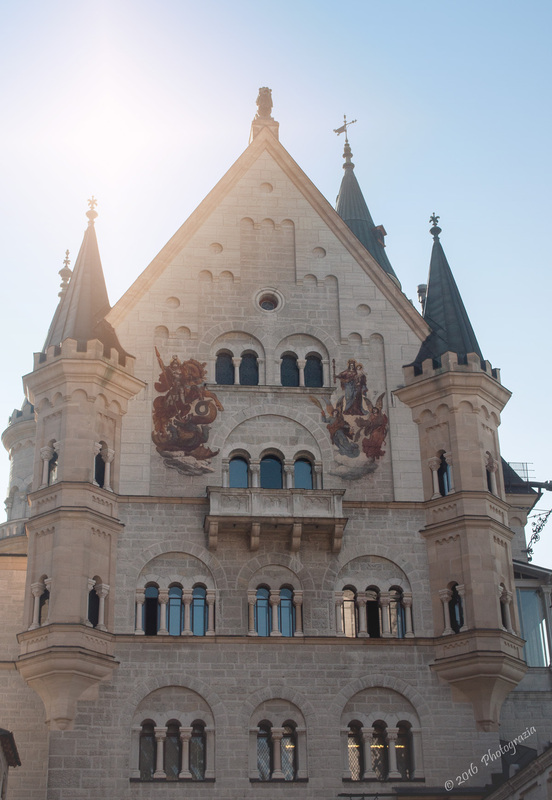 Neuschwanstein, or “New Swan Stone,” was the brainchild of a young king raised to be dutiful, but more comfortable with the rich fantasy world of knights, dragons, and the operas of composer Richard Wagner. Swans were a main theme throughout his life. As a matter of fact, one of his nicknames was, “The Swan King.” Not surprisingly, he identified with Wagner’s work, Lohengrin, and its Swan Knight. 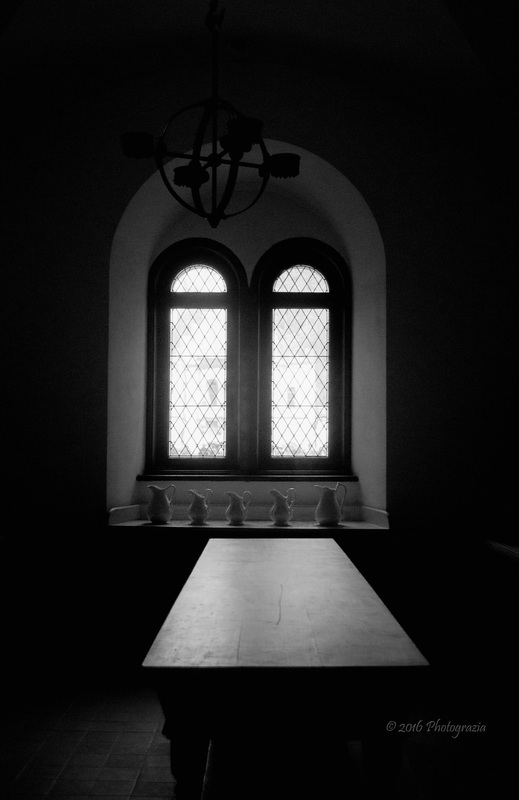 Walking through Neuschwanstein, visitors see swans incorporated into the design and details of almost every room. There is even a life size, porcelain swan which was a prized possession of his. So who was this young king? His name was Ludwig and he ascended to the throne in 1864 after his father died. Suddenly, at 18, the isolated, shy prince became King Ludwig II of Bavaria. His was not a successful reign, though. His first year was a disaster and the second year was even worse. It was fraught with political upheaval that rendered him unable to effectively rule. Prophetically, Wagner’s vibes from their first meeting were spot on. Things did not go well for King Ludwig II. Things went very wrong. Throughout the tour, the guide offers up tidbits about Ludwig’s life, his money woes and the fact that rumors circulated wildly about the king being insane. No one knows exactly what happened. Today, there would be cries of conspiracy and non-stop tabloid coverage regarding his mysterious death at 41. There are a lot of theories, but the fact is, banks were nervous about extending any more credit to Ludwig for the overruns on his castle’s increasing expenses. They were threatening to seize his property. People didn’t understand the King’s preoccupation with knights and dragons. They didn’t understand why he slept all day and took carriage rides at night. They didn’t like that he was becoming a recluse in the mountains. His ministers didn’t like that there was talk that he was going to clean house and replace everyone. They were questioning an awful lot about King Ludwig II. There was only one thing for them to do: declare him insane and then depose him. Paperwork was prepared. The plan was in motion. Four psychiatrists declared him insane and they set out to depose him. On June 12th, 1886, they arrested King Ludwig II at Neuschwanstein and took him south of Munich to Berg Castle, on the shores of Lake Starnberg. With him was a Dr. Von Gudden, chief of Munich Asylum. Ludwig, now known as “The Mad King of Bavaria,” asked Von Gudden, “How can you declare me insane? After all, you have never seen or examined me before?” Apparently, the doctor replied that it was not necessary to know him. There was enough “evidence” for the medical community to sign off on the paperwork. Hmmm…. Anyway, the very next day, Von Gudden and King Ludwig II took a walk by the lake to talk. Within an hour, they were both found dead, “drowned” in Lake Starnberg. No one knows for sure what happened. But the autopsy indicated that the King had no water in his lungs. There was also a report that the doctor was beaten pretty badly. Years later, a woman produced a coat, supposedly worn by Ludwig that had two bullet holes in it. And a servant, hiding behind a tree during the walk, hoped to signal the King in an effort to help him escape. What he saw, however, was the murder of the two men. He was threatened never to speak of what he witnessed, not even to his wife. Is any of this true? I don’t know. But newly published theories seem to confirm that King Ludwig II was not insane at all. Supposedly, there were people willing to testify on his behalf, but they were never heard. We’ll never know for sure. What we DO know is that King Ludwig II was probably not as political as he was artistic, talented, and gifted in all things related to architecture and design. He loved a fantasy world far more than the real world. That didn’t make him crazy. Today, it probably would have earned him a Tony Award or a spot on a university’s faculty teaching medieval history. He left a legacy. 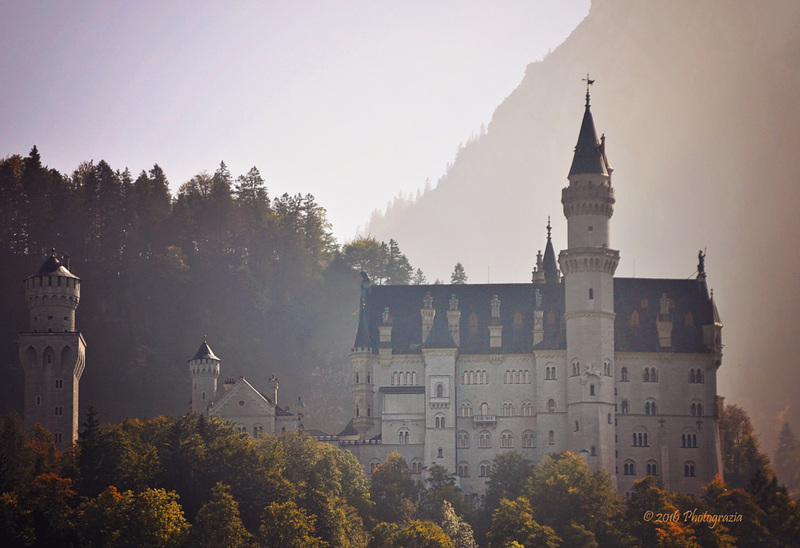 The Neuschwanstein Castle boasts nearly 1.5 million visitors per year. It is the most visited castle in all of Germany. The castle has more than paid for itself many times over. It has become an icon for Germany. It has been featured in books, movies, television, etc. Visitors are only allowed to go through the castle on a guided tour. Photographs are not allowed. It was so difficult for me not to start clicking away at the lavish paintings or the chandeliers in the shape of crowns. People are amazed at the detail and extravagant furnishings. The King’s bed alone has amazing carvings across the top that took fourteen carvers four years to complete. Next to the drawing room there is a passageway that connects to the study. This passageway evoked the most gasps and awe on the tour. It is an artificial grotto with ceiling to floor rock. One feels as though they are making their way through a cave! Then there are the paintings! Huge oil paintings and frescoes depicting medieval love and fantasy adorn the walls. The Throne Room is amazing in every regard, except that it doesn’t have a throne. The king didn’t live long enough to see it ordered. Throughout the finished rooms, visitors can see the most beautiful inlaid tiles and wood designs of exceptional quality. This castle, high atop the cliff even has running water and flushing toilets, too! Everything about this castle is a marvel, except the story’s end, of course. While recognizable from magazines and travel guides, few people know the true story behind Neuschwanstein. It may have all the characteristics of Disney scenery, but there wasn’t a fairy tale ending here. 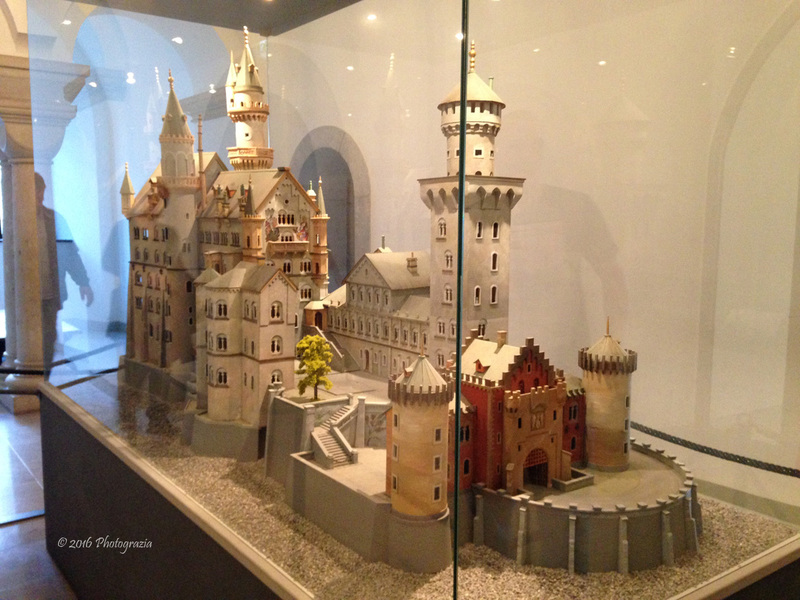 King Ludwig II dreamed of retreating to his beautiful Alpine castle. However, he only got to stay in it for 11 days. His legacy, like the questions surrounding his sanity and his death, will last forever.